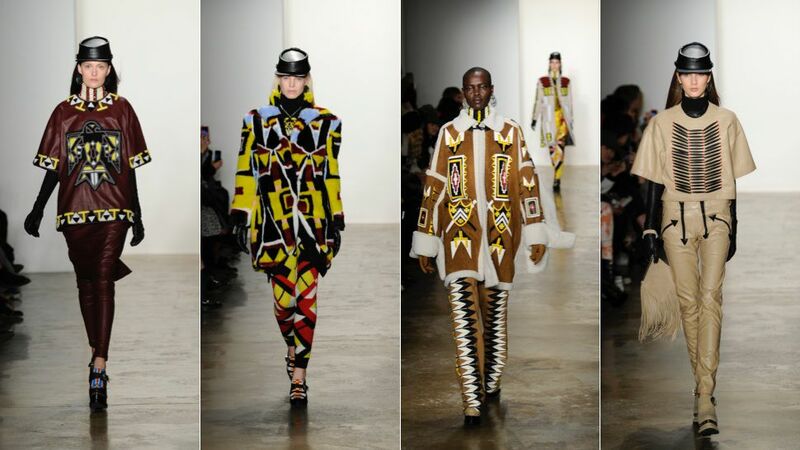 London-based fashion house KTZ debuted their fall 2015 line at New York Fashion Week Tuesday, February 17. The 45-piece collection featured obvious homage to Native American aesthetics mismatched into a rather offensive play on classical indigenous design elements. Models wore pieces defined by bold prints, leather accents, and beaded detailing. Many accessorized with military caps resembling those worn by the very Europeans who inflicted mass cultural genocide upon Natives in the 1800s. There was no look displayed on the runway that would possibly be worn by Native women in a traditional sense–this disconnect making the collection all the more atrocious. Style.com praised the designer’s work, stating, “Pejoski’s muse would appear to be a nomad for whom life is one long Burning Man…It’s not his intention to be accurate.” If the end goal was, in fact, this blatant inaccuracy–KTZ certainly succeeded. Beyond surface level appropriation, Native artisans have come forward to accuse Pejoski of ripping off specific designs. 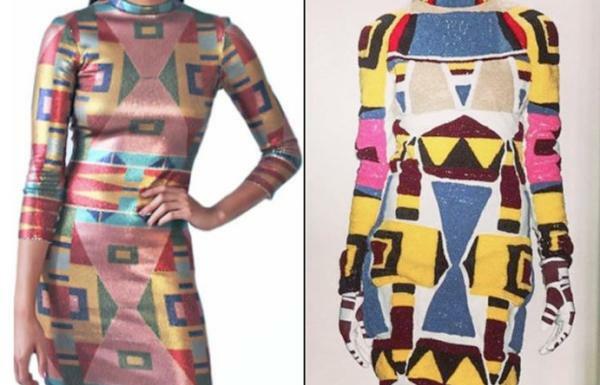 Northern Cheyenne/Crow designer Bethany Yellowtail says she was shocked to see a dress eerily similar to her own Apsaalooke Nights frock on a live stream of the catwalk. This dress was inspired by her grandmother’s traditional Crow bead work, she says. “I felt gutted, I felt erased, as if my voice and my perspective of indigenous design disappeared…I’ve worked in corporate fashion for years and have seen brands debut ‘Native inspired’ collections every single season. This is nothing new, it’s not a revelation–however, this one was personal,” Yellowtail told Indian Country Today Media Network. Critics on Twitter presented their own comparisons of Pejoski’s designs beside Native work. The mass response to this collection reveals just how complex the designer’s adoption is. The Lakota People’s Law Project agrees that Native iconography adopted by the mainstream must be acknowledged as a meaningful aspect of a culture as legitimate as any other. Pejoski’s combination of Native features with “a modern twist with a lot of English fetishes” is a sorely misguided method of honoring inspiration. Native American design certainly deserves admiration and praise where due from the fashion world. However, the means of this appreciation is in need of recalculation. Picking and choosing from elements unique to individual tribes and customs without fully considering their meaning is tasteless. This artistic theft ultimately makes for unremarkable, stale collections. Native plagiarism has been done time and time again. Hopefully, non-Native designers will hear out well-meaning critics and turn their creative attention to producing fresh, original material. Respectful, intercultural collaboration will be possible once these designers face the reality of their unconscientious borrowing. Hoping some genuine Native American fabric designs are highlighted. Maybe an all Native American designers’ show??? ..perhaps certify “genuine Native American designed…outfit, fabric, etc.” Exploit the interest to establish native Americans in this industry!